Exquisite dining in a splendid setting. Located in downtown Oranjestad on Weststraat 7, on the second floor, with a marvellous view of the harbour. 7 WEST Restaurant Aruba offers gourmet international caribbean food for a reasonable price. Aruba is widely recognized as the culinary capital of the Caribbean, and among the island's many fine restaurants, Aqua Grill is a standout. As the Premier Seafood Restaurant on the island, Aqua Grill boasts a menu of fresh seafood flown in daily from around the world, as well as a selection of non-seafood dishes. Wine should say house wine, Beer should say local beer. Not valid in combination with other offers. Offer valid for maximim 2 persons. When you’re in the mood for something different, discover the charm of old Havana at Cuba’s Cookin’. Satisfy both appetite and soul in this intimate eatery built in 1877, in downtown Oranjestad. The smells of delicately flavored and char-grilled Caribbean fish, seafood, steak and chicken mix easily with the Latin rhythms. A live Cuban Duo nightly, creates an extremely warm and authentic atmosphere to compliment the meal, or to savor a hand-rolled Cuban, in the Cigar Salon afterwards. Over 175 original Cuban paintings add to your unique experience. Enjoy a truly forbidden slice of life from old Havana! Located near the large supermarkets, it is the perfect place for a chat, an informal meeting or just to have a peak at the newspapers and sip a drink by yourself. At Delifrance we offer French baguettes, soups, juices and amazing coffees. Come in for breakfast, lunch or your coffee break. This comfortable downtown restaurant, established in 1986, specializes in fresh seafood from the Caribbean Sea and is a favorite spot for Aruban-style seafood dishes. Fresh fish is caught daily by the owner himself and is perfectly prepared by our talented local chefs. Located in the Marina Hotel featuring fresh certified Angus Beef and an extensive international wine list. The Restaurant offers a contemporary setting with sweeping views of the marina and bustling boulevard below. *For seatings between 5:30pm - 6:00 pm and 9pm-11pm only. Minimum check $100 per couple only. Not valid in combination with other offers. We want you to experience an unforgettable evening in our majestic setting. We're located right on the pristine turquoise waters, just drive south of Oranjestad. The setting is unmatched. The view and sunsets are spectacular. Imagine delicious steaks and seafood, then you’ll realize that Marina Pirata is worth the drive. So get away from the crowds and join us for a fabulous dinner. Come and dine with the fish. Located in the luxurious and comfortable Casa del Mar Beach Resort, Matthew's combines fine dining with an unparalleled view of one of the most beautiful beaches in the world. Moomba Beach offers a unique and exciting outdoor dining experience at the beach. A spectacular setting, encompassing a magnificent view of the Caribbean Sea. MooMba's is a casual, fun, outdoor restaurant housed under a huge palapa. Aruba's only restaurant on the ocean, open for lunch and dinner, offering panoramic views and beautiful sunsets in a casual and romantic ambiance. Serving an excellent array of fresh seafood including lobsters. Live entertainment is featured several times in the week. Pureocean is a newly redesigned restaurant and features modern white décor with an open-air layout that invites in cool island breezes for a comfortable, island atmosphere. Dine beachside in the bistro or at tables situated under palm trees wrapped with twinkling lights. The second option is perfect when you want to enjoy a romantic dinner. No matter where you choose to sit, you’ll have a perfect view of the beautiful Aruban beach. Let us tell you a little bit about the history of Que Pasa. In 1992 a few young guys started the restaurant after a great night out in town. In an old "cunucu-style" house Que Pasa began growing from a small bar-bistro to a mature restaurant. We have been trying to improve the quality ever since and keep the atmosphere like it was in the beginning. We'll hope to see you soon, and have a marvelous time. Sole Mare is a traditional family restaurant. Since opening day the Italian eatery has never veered from its philosophy of serving delicious home-cooked Italian food, with rich, fresh flavors, at reasonable prices and in hearty portions, delivering an authentic slice of Italy. 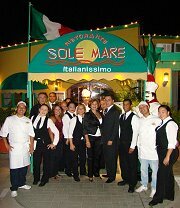 Sole Mare restaurant is located in the heart of Palm Beach within walking distance of all the hotels. Kids can enjoy choosing from the Kids Menu and the early bird dinner serves a three course dinner for $25,-. The Chophouse offers an exquisite tentalizining menu for everyone's taste buds and food preferences. You will now be able to entertain your group of friends including the meat and fish lovers without having to shy away for vegetarian and vegan dishes. Experience tastes like no other at the Restaurant at Tierra del Sol Resort & Golf offering fine Caribbean cuisine. Relax for a casual lunch on our outdoor terrace while taking in the most spectacular views of the Caribbean Sea. This nicely decorated restaurant serves a simple continental breakfast buffet ($8.50 excl. 3.55 tax) and lunch and dinner a la carte. For very reasonable rates this restaurant offers a combination of Caribbean and Dutch dishes in very pleasant surroundings.